People of Benin every year celebrate Armed Forces Day on October 26. This is a public holiday, people enjoy a day off and children don't go to school. Celebration of Armed Forces Day is connected with the events, that took place after proclamation of independence in Benin. The country was administered by France for a long period. France granted Benin independence as a part of the Republic of Dahomey in 1958. 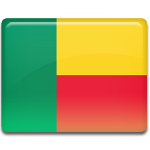 Benin gained final independence only on August 1, 1960. The next years of independence were marked by political instability and economic turbulence. Finally on October 26, 1972 Lieutenant-Colonel Mathieu Kérékou overthrew the ruling triumvirate and became president of Benin. He has significantly contributed to the development of the nation. One of his historical decisions was reorganization of the Benin Armed Forces. The triumph of the revolution is observed by people in Benin as Armed Forces Day. The military parade is annually organized in Cotonou, Benin's largest city and economical center.